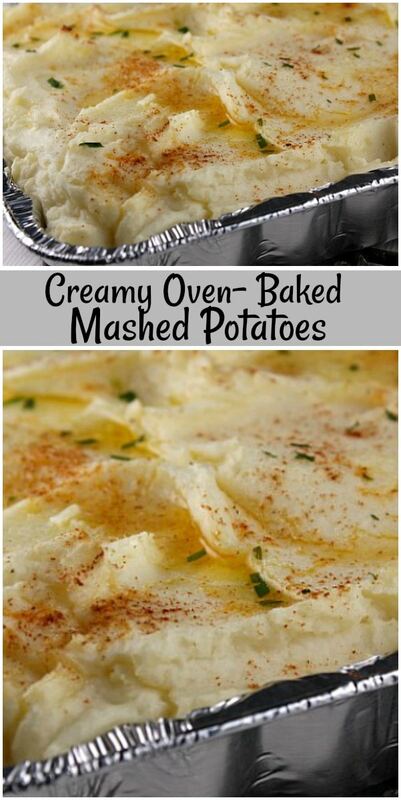 These Creamy Oven Baked Mashed Potatoes are so simple to make, and I’m including make ahead instructions here too! What makes these creamy? 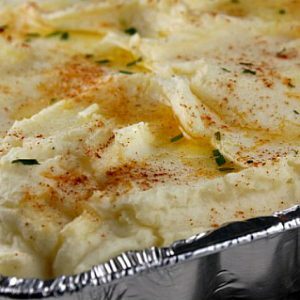 Additions of cream cheese, sour cream and butter make these Oven Baked Mashed Potatoes so smooth and creamy and rich. Everyone loves these, and they’re always a bit hit. You can lighten up the recipe a bit by using low fat cream cheese and light sour cream, but I recommend you go all out and use the good stuff! The potatoes are boiled until quite soft. Mash, and then mix in cream cheese, sour cream and garlic salt. That’s it! Then spoon the mashed potatoes into a buttered casserole dish and dot with pieces of butter. Garnish with chopped chives and a sprinkle of paprika. Bake for 15 minutes. Or make them ahead and bake them when you’re ready for them! 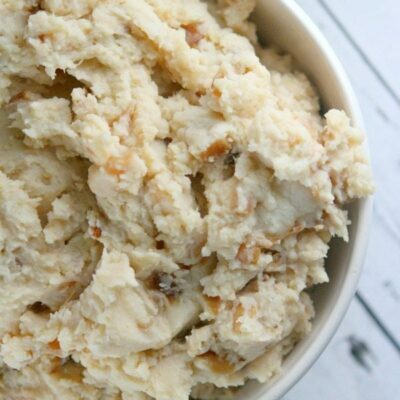 Are there Make Ahead instructions for these Mashed Potatoes? I like to make these potatoes ahead of time and keep them in the refrigerator. Prepare the recipe and place the potatoes in a casserole dish with garnishes on top. Cover with plastic wrap and refrigerate until ready to heat. Remove from the refrigerator and let it sit at room temperature for at least an hour before baking. Remove plastic wrap, and bake as directed. 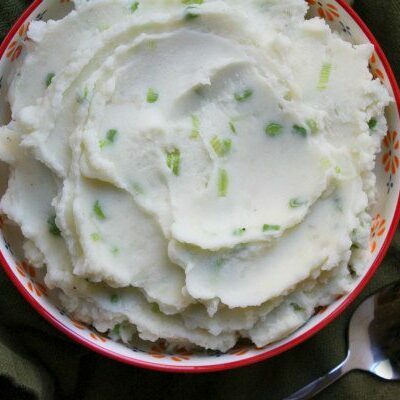 If you’re lacking oven space, use your slow cooker to heat up the potatoes instead! 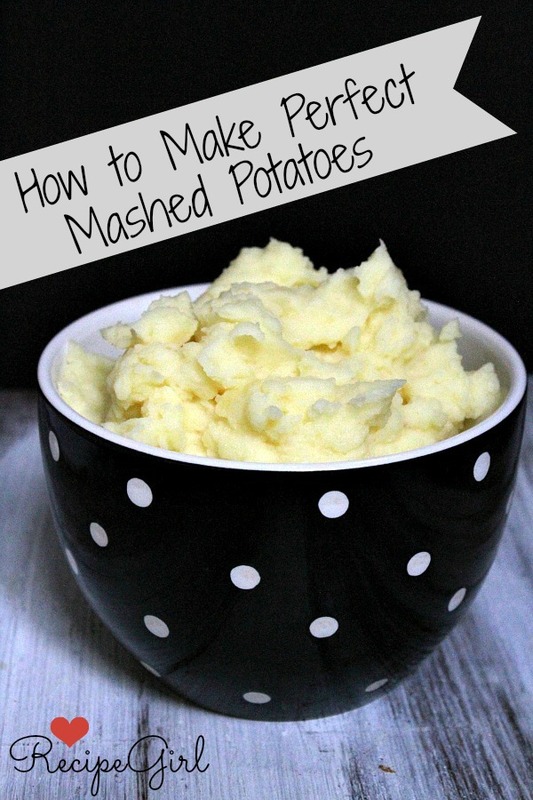 I also have a step-by-step tutorial on How to Make the Best Mashed Potatoes, if you’re interested in checking that out. I think they turn out perfect, but they’re not quite as creamy as my Creamy Oven Baked Mashed Potatoes since there is not cream cheese or sour cream in that one. 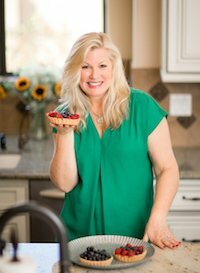 And if you’re looking for complete Thanksgiving menu ideas, be sure to check out my Traditional Thanksgiving Dinner Menu and my Gluten Free Thanksgiving Dinner Menu. 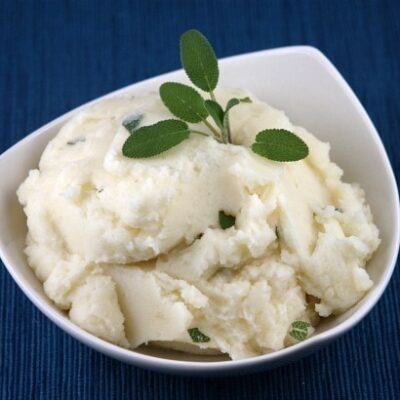 These mashed potatoes are so simple to make! Boil the potatoes in a large pot of water until tender. Drain, transfer to a large bowl and mash. Add all of the other ingredients and beat with an electric mixer until fluffy. Transfer the potatoes to a large, buttered casserole dish. Top with dots of butter, chopped chives and paprika. Preheat the oven to 350 degrees F. Bake the potatoes for 15 minutes, or until they begin to brown on top. 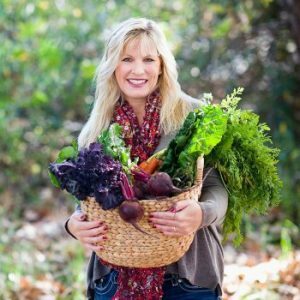 *Make ahead instructions: Prepare the recipe and place in a dish with garnishes on top. Cover with plastic wrap and refrigerate until ready to heat. Let sit at room temperature for at least an hour before baking. Remove plastic wrap, and bake as directed. *If you're lacking oven space, warm these up in a crockpot instead. *It's' perfectly ok to lighten this recipe up a bit by using low fat sour cream and cream cheese. What size casserole? 13 × 9? If it’s a deep one– a little larger than 13×9 would be best if you have one! I loved it! 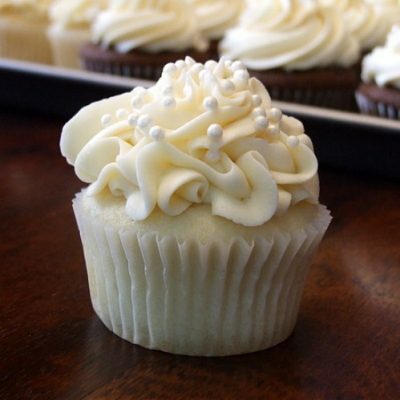 SO creamy and easy to make! A must have at our family holiday dinners! I love that you can make these potatoes ahead of time. This is the only way to go when entertaining for the holidays! Besides tasting amazing, I love that these can be made ahead of time! They’ll be on our menu again for Christmas! If I want to put it in the crock pot, how long would I put it in? I haven’t made these in a crockpot, so I’m not sure. how far in advanced can these be made? I would make them one day ahead. 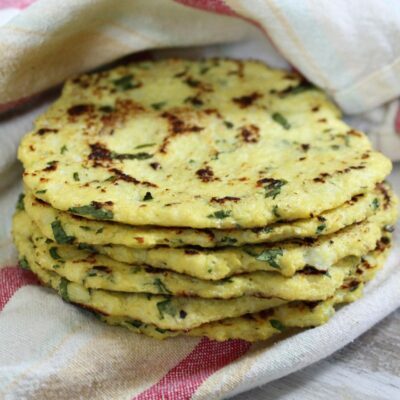 these are just as delicious made with instant potatoes. Can’t taste the difference. I made these potatoes for Christmas dinner and they were a hit! I added extra butter/ margarine and only had a little sour cream in house so I added some half and half. Awesome! I will definitely fix again. 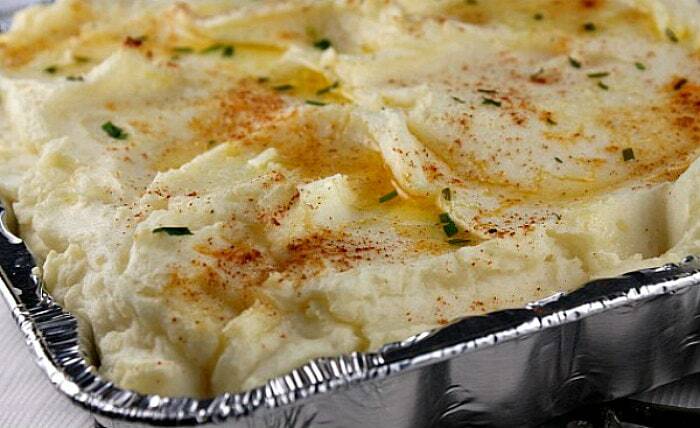 Love mashed potatoes baked in the oven. It’s also yummy if you add some parmesan or gruyere.